Size Height 270 mm, width 194 mm. Watermark Siren. Drake's identification: Watermark type 25. Drake's description: Siren in 39mm circle, crown above. Watermark found in 1632. 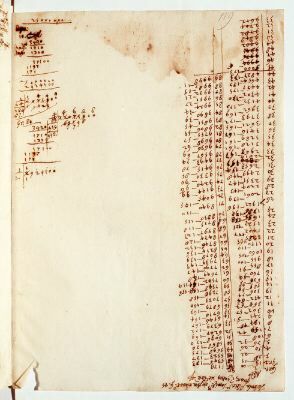 Comments Written by Galileo; contains table, short text, calculations. Relation to the Discorsi: related to 3/13-pr-06. 1 Tabula altitudinum semiparabolarum infra elevationem gr[adus] 45, quarum impetus sit idem etc.